I'm so good at procrastination that I should give lessons - Maybe tomorrow. For the longest time I've been saying how I can't really do anything as it's cold and miserable. Now the sun is shining, and it's wonderful outside, I don't want to to anything as the weather is too good to waste. Ah well, there's always next week. Lady Jane makes far more smoke when she first starts, especially when it's cold. 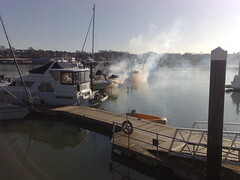 I just could not resist the image, as it looks like those boats are on fire. So this is the state my deck is in now. I partly blame the weather, the cleaning up/welding/painting job had to be abandoned last year, as the weather when I was around was just not conducive to this kind of work. The other junk you can see lying around is on account of loosing the extra storage space the crane barge afforded me. From the sound of it, the crane barge may be pressed into service more regularly in future, so I'll either have to live with the junk, or ditch it. 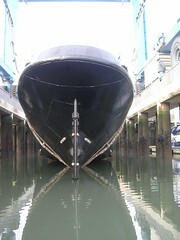 Hopefully, now that winter is behind us we can have all hands on deck - working at getting things shipshape again. 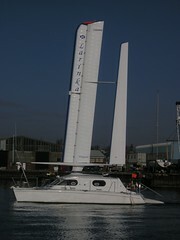 I've seen quite a bit of this trimaran up and down the River Itchen recently. Larinka is certainly a distinctive looking vessel, with the funkiest sail setup I've ever seen. I wonder if we will see sails like these on the fast racing yachts any time soon? Wood panelling inevitably follows insulating the place. Without some sort of protective covering, that insulation will just get wrecked, And besides it will all look so much better when it's finished. The panelling is the tricky bit though, as cutting the ply to shape is much more challenging than cutting and jamming in the insulation. Most of the time spent is in measuring and cutting the intricate bits, so the ply can fit around all the existing 'stuff'. Like the light switch and those yellow handrails you see. The plywood panels you see are not fixed in place yet, just in case you were wondering! Ok, so splashdown may be taking a bit of poetic licence here. What you are actually seeing is the culmination of Wendy Ann 2's transformation from so much scrap metal into an actual floating vessel. An emotional moment for all concerned. More pictures here. Hearty congratulations on such an amazing achievement, Seb and Becky. Both Seb and Becky stand out as shining examples to all of us in similar circumstances. Their almost single minded commitment to getting the job done is nothing short of amazing. 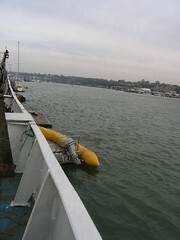 Even I, the eternal optimist, at one point had doubts that Wendy Ann 2 would ever get back in the water. It is good to be proved wrong from time to time. Seeing this launch, in turn, also helps motivate me with Lady Jane. So here's a first glance at a chart of my main engine temperatures with the engine running - very exciting (for me anyway). I've only connected three temperature sensors, as this is still in development. I didn't want to go mad and connect up much more, only to find there was some kind of problem. Oh, and I'm also still deciding where to physically locate the rpm sensor, so that data's not shown at the moment. The engine was idling at a steady 230 rpm for the time shown on the graph, while the seawater inlet temperature was six degrees. The freshwater inlet and outlet temperatures you see on the chart are the same because the thermostat, which then starts the seawater cooling the fresh water, has not yet opened. By way of explanation, the main engine, and turbo, is cooled with freshwater, this freshwater is, in turn, cooled with seawater. It's done like this so no corrosive seawater ever gets into the main engine itself. Seawater also cools the inlet air from the turbo, the engine oil and also the gearbox oil, hence the steady rise of that temperature. I am somewhat surprised to see the temperatures flatten off at thirty odd degrees, but the thermometers on each of the cylinder heads corroborate this, so I know my engine temperature sensors are working properly. The engine is, I suppose, doing no real work, so is likely to stay relatively cool. The insulation continues to spread. 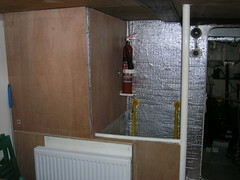 Here you see insulation recently installed above the engine room space, right in the core of the boat. Right now, with it being so cold and miserable, there is not much else I feel motivated to be getting on with. There is no doubt that I'll never get this part of the boat properly insulated, but this is so much better than bare steel. Seeing as I have a roll of the high-tech insulation, I may as well put it to good use. I get the feeling that once I have all the reasonable spaces insulated, winter will probably be over and I'll be thinking that I could have been doing something more productive on board. I know I've only recently started posting about PC based gauges and monitoring for Lady Jane's main engine, but the reality is that this step has long been in the thinking and planning stage. Pretty much since I bought Lady Jane, I've been aware that much of the old wiring has simply been hacked out even though it may still have been operational, including wiring for the old engine sensors. I've got two old sensors on the gearbox, a neutral switch and the sensor you see in the picture, none of which are connected to anything which renders them pretty much useless. After enquiry with Amot Controls it turns out that the blue sensor you can see is a combined pressure and temperature switch. I've no idea how it was all set up, but I presume it was an alarm for the freshwater temperature going too high, or the oil pressure dropping below a certain point. At least that's what I'd be interested in having alarms for. Anyway, the fact that oil poured out of the sensor casing when I opened it up leads me to suspect the control itself is unlikely to be much use in future, chopped wires or not. Loosing the old control gives me a convenient take-off for an oil pressure sensor, which can easily be mounted somewhere nearby and, when I'm ready, will also provide a handy place to mount the freshwater pressure sensor. Lady Jane's main engine, a 6 cylinder Industrie, is dripping with all kinds of gauges for both pressures and temperatures. Each cylinder has both a cylinder head temperature gauge and an exhaust temperature gauge. Some of the exhaust temperature gauges have stopped working, but the cylinder head ones are all working just fine. It turns out that the cylinder head gauges are replacements for the original, beautiful, brass Industrie temperature gauges. The originals were apparently stolen while Lady Jane was laid up in Ireland, amongst other brass fittings. 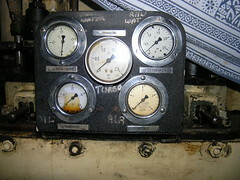 The pressure gauges you see in the picture are, from the top left, labelled as: Freshwater, Turbo, Saltwater, Oil and air. In reality, the pressure gages are, from the top left, Disconnected, Turbo, Freshwater, Air and Oil. I'm so used to it now that it seems normal to me! 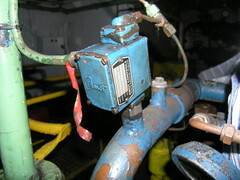 The oil pressure gauge is also repeated in the wheelhouse. To be honest, I don't really trust the readings on any of the pressure gauges, and only really go by their relative positions compared to what I've seen them read before. It turns out that replacing them is not as easy as it would first seem, and expensive, which is why I started down the line of the electronic engine monitor that I've been working on. The first electronic pressure gauge on the list to get implemented will be the oil pressure gauge. With that working well, the rest should be relatively straightforward. I'm planning on implementing these pressure gauges in addition to the existing ones, not as replacements for them, so if all else fails I've not lost anything. 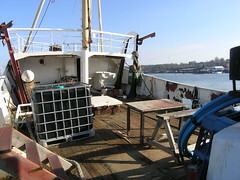 This is a post on my views and experiences with insulation on board Lady Jane. I have written this in response to the questions/comments I've had recently on the subject and, hopefully, as a means of helping others. I apologise if it's a little long. This piece was originally longer, but I chopped it already. I don't claim to be an expert in any of this, having only the experience of Lady Jane as the basis for this piece. There are, I'm sure, people better qualified than me to comment, but ultimately it's really only time that will tell which approach is the best. Oh yes, and I can only really speak of insulating a steel boat, though obviously some of this will apply to other types of vessel as well. First off, steel and water do not get on, especially steel and salty water. The issue with salt water is that once it evaporates, the salt remains. This salt then gets damp when the humidity goes up, making the steel wet again without even adding visible moisture - hence salty water causes rust issues for cars from coastal places. It seems to me that steel and water get along least well when the water is trapped against the steel in an evaporate/soak type cycle. The worst scenario seems to be damp wood against steel - especially if the damp has a high salt content and more salt gets added over time. It also seems to me that painted steel which has then rusted tends to get worse faster than rusty untreated steel. Now everybody knows that when warm air hits a cold surface, the moisture in the air condenses out - great for a cool mental image of a cold beer on a warm day, bad for standing in the galley cooking breakfast with condensation raining down your neck. Ok, so in terms of insulation on a steel boat, the basic trick is to ensure that water, in any form, does not get trapped against the steel. If warm air inside is prevented from getting to any steel cooled from outside, condensation and therefore the ensuing dampness and ultimately rusting should not occur. Though in reality, to some extent, moisture will inevitably get through regardless of how much effort has gone into providing a good moisture barrier. I believe that, no matter what insulation is chosen, the basis for preventing rust issues behind insulation is primarily good preparation of the underlying surfaces. A really good cleanup of the steel, followed by at least three coats of good quality primer being the minimum. That way, any moisture sits against paint, and not steel. The deck head in both the galley and in the wheelhouse on Lady Jane was insulated with expanded foam and covered over with cheap chipboard with a thin plastic laminate layer on the outside. Some forty years later, when I removed the insulation, the underlying, painted, steel was still mostly in good condition even though it was obvious the expanded foam had been damp and, inevitably, some rust had occurred. Admittedly there were holes in both the wheelhouse and galley deck heads, but the holes seem most likely to have been caused by rusting from above, rather than from inside. 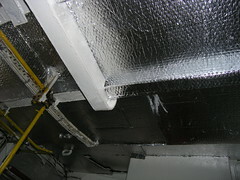 Once moisture had got in behind the insulation, the resulting rust was not a pretty sight, but that's a different issue. Down below, bitumen had been used to protect the steel. Much of the steel was like brand new forty years later - even down to the original craftsmen's chalk marks which were still visible. Because of all the above, so far as I'm concerned, the best insulation to use is dependant more on it's effectiveness, practicality in applying it and, of course, the money you have available to you. Ideally, I suppose, the steel behind any insulation should be 'serviced' every say 10 years, to monitor and stay on top of any potential rust issues. Thinking through some of what I've done, this is not really practical though. The best insulation, by a long way, that I have come across has been two part polyurethane expanding foam insulation when it has been properly applied. The foam is sprayed onto the prepared surface in a very similar manner to spray painting. Obviously the steel surface must be well prepared and painted, so the spray foam can adhere to the surface. Applying the spray foam takes some preparation, but is fast and very efficient. We are talking hours versus days compared with some of the other stuff I've used. I also believe the spray foam does away with any issues of water getting behind the insulation, as the spray foam is effectively an extension of the coating given to the steel. The next best insulation I've found has been the likes of Kingspan or Xtratherm - shown above, which is a similar material to the spray foam. There are plenty of different trade names for this. You simply buy huge sheets of the stuff at whichever thickness suits you. The cutting and fitting the insulation sheeting is messy and time consuming though. In comparison to the spray foam, I'd say it's difficult to fill all those difficult little spaces that the spray foam just blasts into and fills in no time. I found filling the gaps with the two part polyurethane spray foam worked will though. 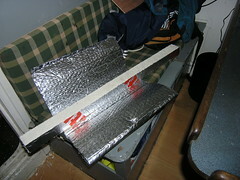 I have also been using the hi-tech insulation foil. - shown above, which does seem to insulate remarkably well given it's thickness. This stuff I have simply been cutting to shape and gluing in place with cheap glue. I figure it's so thin and light that even flour and water would probably keep it in place (not that I've tried). This high-tech insulation has proved great for places where it's just not practical to put in thicker insulation, such as on some of the walls of the galley and in the space above the engine room. I have found it fun to test the effectiveness of what I've done by using a cheap infra-red thermometer to gage the effectiveness of the insulation I've installed. Reading -2C on the steel outside and 18C on the insulation inside makes me feel pretty good about things. The thing I'm finding on Lady Jane is that some insulation, any insulation, is so much better than nothing. The more the better, up to a point obviously. Thinking of the bare steel as a kind of reverse radiator, anything to prevent the contact of warm air against that steel will minimise condensation and prevent the steel from absorbing the heat from the air it would otherwise be in contact with. One last word. I'm planning on gluing plywood panelling straight onto the insulation and, where practical, augmenting this glue with wooden battens to help hold the whole lot in place. Again, any old glue will do as the ply is thin and light. The ply will be painted over, so there should be no issues with the ply de-laminating. There is already similar ply elsewhere on board, and there has been no de-laminating issues. I hope this helps. Feel free to add your comments if you have anything constructive to add to this for others. Hot on the heals of the insulation comes the plywood cladding. The insulation is very soft, and easily damaged, so getting the plywood cladding on quickly is fairly essential. This is going to take a while, especially with all the fittings etc. to work around. At least with the insulation I could just hack my way round. 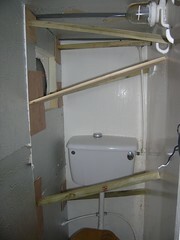 The ply though, needs to be done with some finesse as messes will be all to visible to all and sundry. One of the things I really enjoy about life afloat is the constant change about me. Regular readers will notice that the crane barge, which has not been moved in years, has gone away for a short holiday. Changes like this just don't happen with a regular house. Anyway, when the crane barge returns it should be in somewhat better shape. With some of the worse off sections of it's deck replaced with shiny new steel and maybe a even new, working, crane. The only real effect this has on me is that it's a little more challenging coming and going from Lady Jane. Especially with a tide running. That and she swings round more on her moorings. 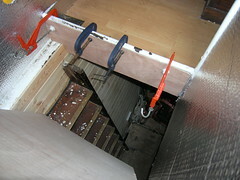 The insulation is slowly spreading to other parts of the boat. Last winter was cold, but not as cold as this one. Hence the sudden emphasis on insulation. Here you see insulation finally going onto the walls of the head. Those walls are outside walls, so tended to get quite damp with condensation when it was cold. The bracing against the insulation while the glue dries made using the head 'interesting' for a while. As Fred observed "it's a little like dodging infra red beams". The deck-head (ceiling), had been done a while ago, but until the back wall is also insulated, sitting on the 'throne' will still not be a comfortable experience when it's cold. 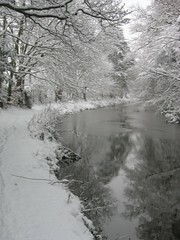 We've finally had a bit of snow. For us here in England this is a big deal, as it does not happen that often. Schools are closed, public transport is on it's knees and driving is treacherous. And that's just on the morning of day 1. Needless to say, most local businesses are either closed for the day, or are closing early due to the snowy conditions. I, meanwhile, wish I was on board Lady Jane, enjoying the transformation a good dump of snow brings to the area.